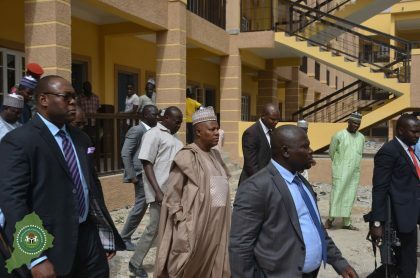 To ensure timely completion of ongoing projects in the State Capital, Governor Kashim Shettima embarked on inspection visit to project sites. The projects include new sites for Marini Asphalt Plants along Baga Road and Auno town, Primary and Junior Secondary School at Baga Road, the Industrial hub, and the Borno State University along Maiduguri – Kano road. At the Asphalt Plant, the Governor was briefed on progress of work on the various projects by the Executive Chairman of the Borno State Roads Maintenance Agency (BORMA), Engr. Satomi Ahmed and Engr. Tijjani Hassan, while at the industrial hub, Engr. 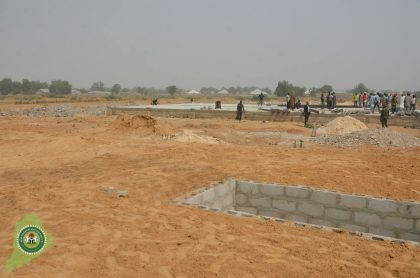 Ibrahim M. Ali conducted the Governor round the industries under construction where he informed Governor Shettima that the equipment procured are the best grades available in the market, and the industries when completed will be one of its kind in Africa. At the State University, the Commissioner for Higher Education, Hon. 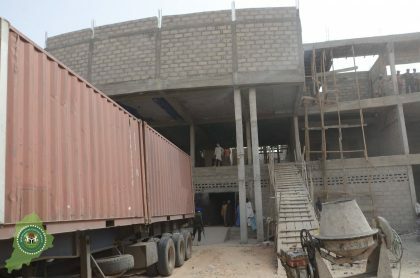 Usman Jaha informed the Governor that thirty three (33) containers of ceramic and wall tiles for the Senate Building and other structures are being offloaded while the tiles for the other buildings are expected in Maiduguri before the end of the week. Responding, Governor Shettima advised the Commissioner to liaise with the Military to ensure absolute security of the project sites and materials received. 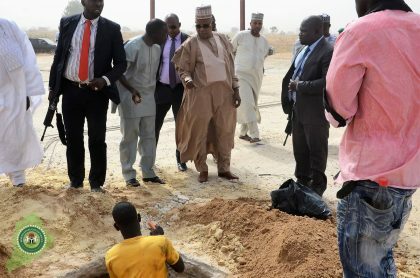 At Baga road Primary and Junior Secondary School, Governor Kashim Shettima directed that the classrooms should be provided with Air Conditioning Systems that can stand the test of time, and commended the site Engineer for the quality of work. Engr. Satomi Ahmed said adequate materials for the completion of roads and drainages have been provided by the State Government, and the projects would be completed for commissioning soon.